A book offering unique information on and insights into Chopin’s pedal indications and the crescendo-diminuendo signs called “hairpins.” According to research, what Seymour Bernstein suggests about the asterisks, or “stars” in between pedal indications is a first of its kind. “A careful, honest probe… of the confusion of Chopin’s pedal marks” Clavier magazine. 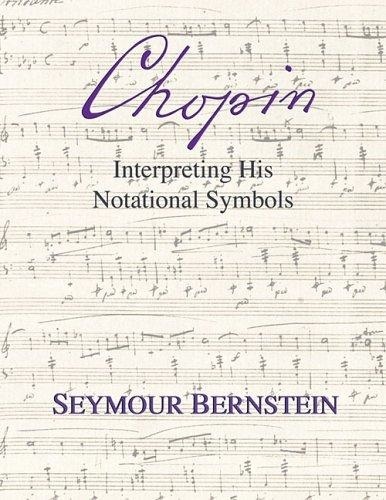 In this text, Seymour Bernstein discusses and illustrates with many musical examples Chopin’s pedal indications and the “hairpin” marks. He writes, “There still remain worlds to conquer in discovering the truth behind, or at least a reasonable assumption about, certain notational indications in music. Among them are Chopin’s pedal signs and the wedge-shaped expression marks often called “hairpins.” We highly recommend this text for all piano teachers and pedagogy students. The book is divided into two major sections: Part 1: Chopin’s Pedal Indications, Notational Enigma, Asterisks and After Sound, Asterisks-Custom of Meaning, Notational Confusion, A Brief Historical Survey, Chopin’s Pedal Signs, 3-Stage Approach, A Language of Choreographic Gestures, Harmonic and Rhythmic Structures, A Scholar’s Point of View, More Large Spaces and Finger Pedaling Summary. Part 2: Hairpins, Wedge-shaped Hairpins, Closing Hairpins, Opening Hairpins, Redundancies?, Contradictions?, Poetic Inflections, Notational Enigma, Possible Interpretation of Hairpins in the Romantic Period, Conclusions and Bibliography. I have just spent a very enjoyable morning reading through (yet again) your book, CHOPIN: Interpreting His Notational Symbols. I continue to be so profoundly impressed with the high intelligence, erudition, creativity and authentic musicianship that informs every word. In particular, I was knocked out by playing through the many musical examples, trying to bring into being the interpretations you offer of Chopin’s seemingly enigmatic notation. Every move you suggest is musically and artistically driven … a wonder to behold. I recommend this book to all of my students, and teach the principles wherever I go. It is no exaggeration to say that it has changed my musical life to spend time with this little book, so full of inspiration and mind- bending concepts. I feel, as always, so very fortunate to have known you. The ghosts of your thoughts are alive in me.